They serve non traditional tapas, as in the small plates are not particularly Spanish in nature, but Ficelle make their tapas inspired by different cultures whether it is French with their baked Brie with apple and raisins compote or Mexican with their Chile Relleno de la Noche. 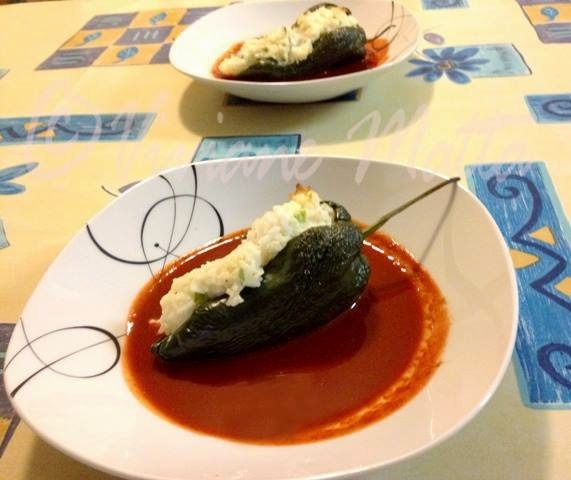 We had their Chile Relleno last week when we went there and it was so good that we decided to copy it, right as we were eating it. It was served on a mole sauce rich with peppers and cocoa. We came up with a draft recipe, then bought the ingredients and perfected the recipe and I am sharing what we came up with. The only thing that we did different than the following recipe is that we did not blanch the peppers. This is how we knew that blanching is a must, because it will create a more even cooking of the peppers and probably reduce the baking time. We had to bake them for an extra ten minutes to get some areas that were left uncooked. If you can get your hands on a real mole or have the time to make it yourself, the result will definitely be better, but for a quick “mole” what we did works. Cook or parboil the rice, set it aside. Cut the Anaheim pepper in small cubes. Cut the Poblano peppers lengthwise, empty them from seeds and remove the white membrane. Blanch them in boiling water and set aside. Mix the ricotta, the sour cream, the shredded Pepper Jack, the Anaheim pepper, the rice, the salt and pepper. Stuff the Poblano peppers with the mixture. Bake them in the oven at 350˚F for 30 minutes. 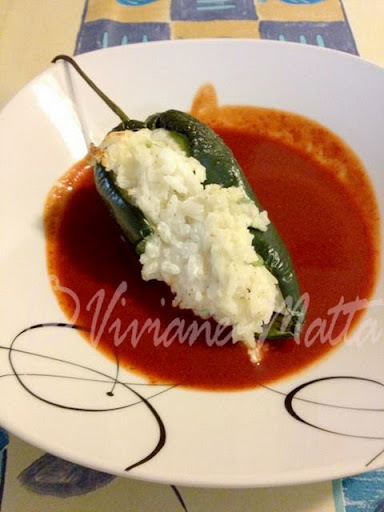 Heat the enchilada sauce in the microwave then whisk in the cocoa, to create a mock mole. 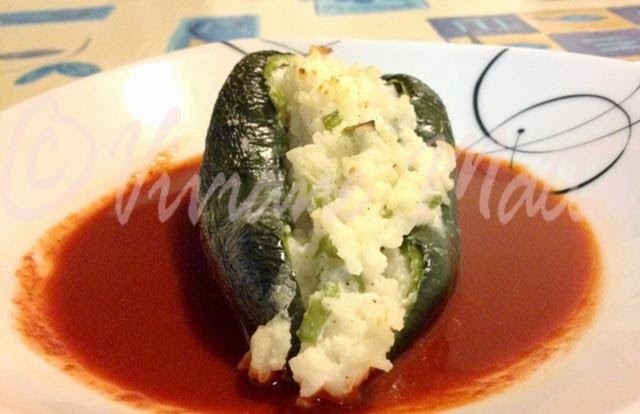 To serve put some mock mole sauce on a plate, then add a stuffed pepper on top. 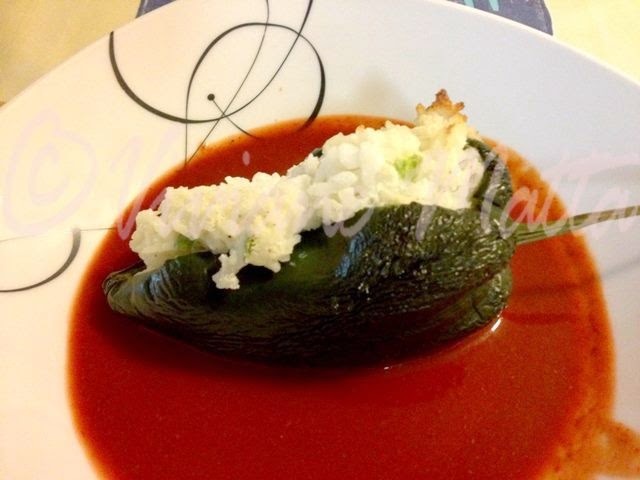 This entry was posted in Cooking, Main Dish, Recipes and tagged Chile Rellenos, Mock Mole, Mole, Quick Mole. Bookmark the permalink.